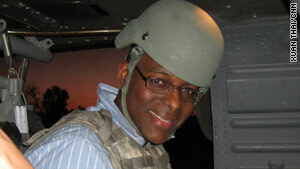 CNN White House correspondent Dan Lothian dons a helmet and flak jacket for the helicopter ride into the Green Zone. Editor's note: CNN White House correspondent Dan Lothian and producer Xuan Thai served as the pool for Vice President Biden's recent trip to Iraq, filing reports for all the networks. Here are Lothian's observations of a trip that took them from Washington to Baghdad and back. Washington (CNN) -- There are many ways to get to Baghdad, but a VIP seat with the vice president offers a unique perspective. Dump the very visible Air Force Two in England, hop on a large, loud and cold C-17 for the flight to Iraq. Then under cover of darkness, armor up and pray up for a quick Black Hawk helicopter flight, complete with side gunners, into the Green Zone, the more secure area of the city where the U.S. Embassy and other critical American and Iraqi government buildings are. Even here danger looms. Insurgents routinely launch rockets into the zone. Being in the wrong place at the wrong time can get you killed. We were warned, "If you hear a siren in the middle of the night, get out of bed and take cover in the kitchen." Thankfully, no alarm sounded. Vice President Biden said his mission here was part of a continued U.S. effort to check on progress in Iraq and offer support as the nation fights violence and rebuilds. But with the crucial March 7 parliamentary elections on the horizon, and a controversial attempt to block more than 500 suspected Baathist politicians from taking part, Iraqis were looking to Biden to help iron out disputes. Top aides said the vice president supports the Iraqis finding their own solutions, but will offer advice if asked. As we moved from the U.S. ambassador's house to Saddam Hussein-era marble buildings that now house the homes and offices of the Iraqi prime minister, president and other officials, security was as you might expect -- beyond extreme. Even though this is the Green Zone, the threat level was burning red. The last time Biden visited, shelling began almost immediately. So the strategy here was to move quickly and carry your armor. Many heavy guns were watching our backs -- well, actually Biden's back, but since we were covering him -- well, you get the point. It was a lot of hurry up and wait. There were quick photo ops with leaders around elegantly set lunch tables, and there was praise for the efforts on both sides. Everyone followed the script. A bit of news came when Biden announced that the United States would appeal the dismissal of manslaughter charges against guards employed by U.S. contractor Blackwater who were involved in a deadly shooting in Baghdad in 2007. Biden ended his trip with a visit to troops at Camp Victory. They presented him with a cake large enough to feed his small state of Delaware, then he worked the mess hall like a politician campaigning for votes. It was classic Biden in his comfort zone. For one hour he shook the hand of every service member who wanted to greet him. Even the cooks in the kitchen got his attention. Baghdad is never a fun place to visit, but it's a critical chapter in U.S. history. As we departed the zone in Black Hawk helicopters, we could see more of Saddam's footprint of excess. Domes and palaces. They're no longer shining, but still standing. Iraq is a country trying to find its political footing, stumbling, sometimes falling down. Violence may take a lunch break, like when we were there, but it always clocks back in. The day after we left, three minibus bombs targeted Baghdad hotels frequented by foreigners. Dozens were killed, many more wounded.